Clemson, SC – Clemson is ranked 18th in the preseason USA Today Coaches poll released on Friday. Clemson is ranked fourth among ACC teams in the poll, trailing Florida State (10), Miami (FL) (11) and Virginia Tech (16). Clemson was ranked #21 in the final USA Today poll of the 2005 season and this is the fourth consecutive top 25 ranking for the Tigers in this poll. The #18 ranking is Clemson’s highest ranking in any USA Today poll since October 14, 2001 when Clemson was 15th. It is the highest preseason ranking for the Tigers since the preseason USA Today poll of 2001 when Clemson was also 18th. 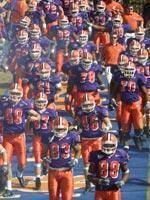 This is the third poll to rank Clemson 18th in the preseason rankings for 2006. Lindy’s and Phil Steele Magazines also had Clemson 18th. The average ranking for the 13 polls listed below is 18.5 so the USA Today poll is in line with the other rankings. Clemson opens its 2006 season on September 2 when Florida Atlantic comes to Clemson for a 3:30 PM game that will be televised by ESPNU.